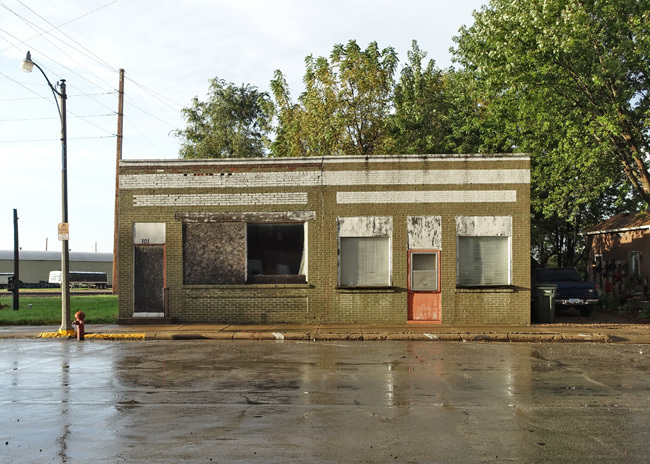 Deep in America's Heartland, grand historical structures stand vacant and neglected. Once stunning embodiments of affluence, their splendor has been worn away by the ravages of time. 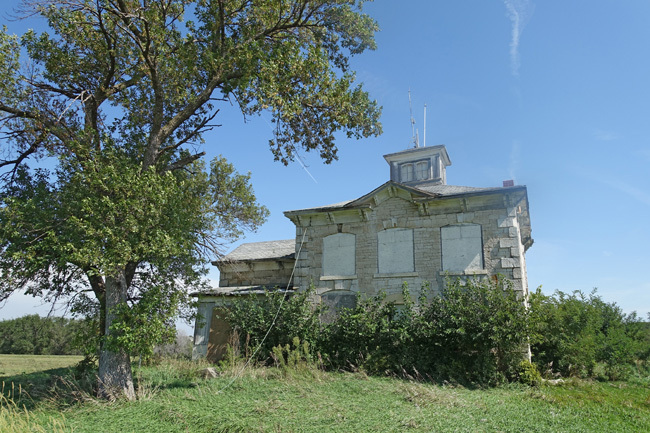 My journey to the Rust Belt took me through some incredible places, including awesome industrial ruins in Nebraska (be sure to check out my article about an abandoned tower in Omaha). 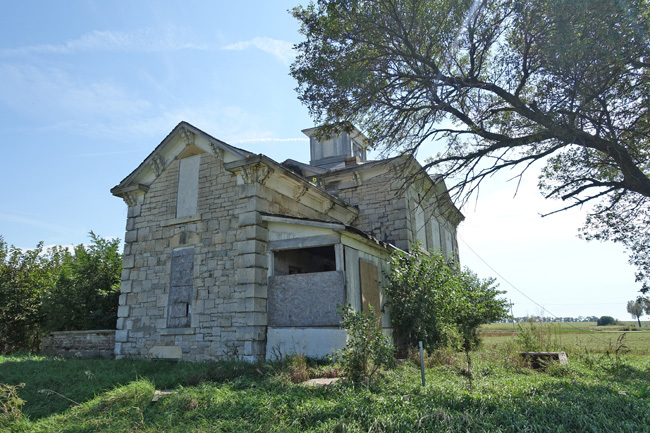 Before saying goodbye to Nebraska, I stopped to admire an abandoned mansion in Ashland, the Israel Beetison House. Isreal Beetison, an English immigrant and farmer with a growing family, hired a team of men to build the house in 1874. 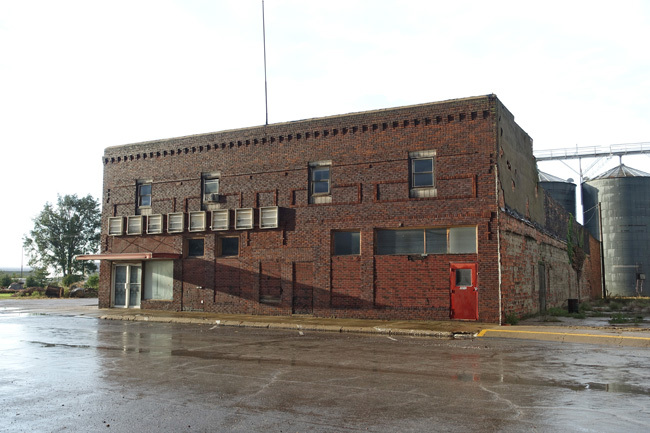 Hand-chiseled limestone bricks were brought in from South Bend and Louisville to make the sturdy 18-inch thick walls. The cupola that crowns the mansion acted as a lookout for native tribes who occasionally came to trade. Four generations of the Beetison family lived in the magnificent house until it was sold to housing developers in 1999. The land around it was transformed and the grand old structure now sites boarded up in the middle of a golf course alongside an upscale housing development. For more information about the Israel Beetison house, visit the Ashland Historical Society. 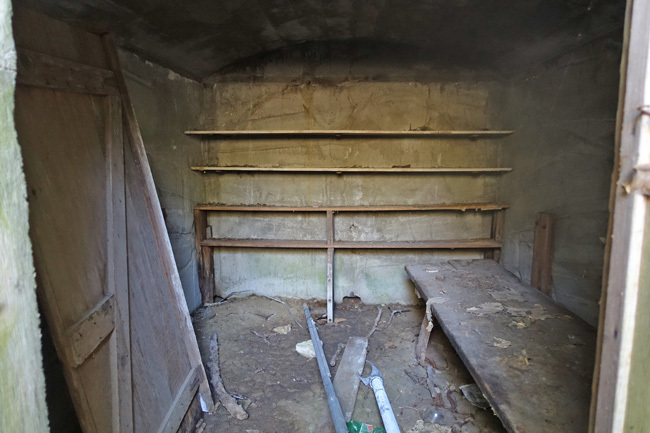 The house is boarded up and off-limits, but I managed to get a photo of the front porch and a storage cellar. As I crossed the border into Iowa, a thunderstorm rolled in. Strong winds and heavy rain made for a treacherous drive. Fortunately there weren't many other cars on the rural roads. 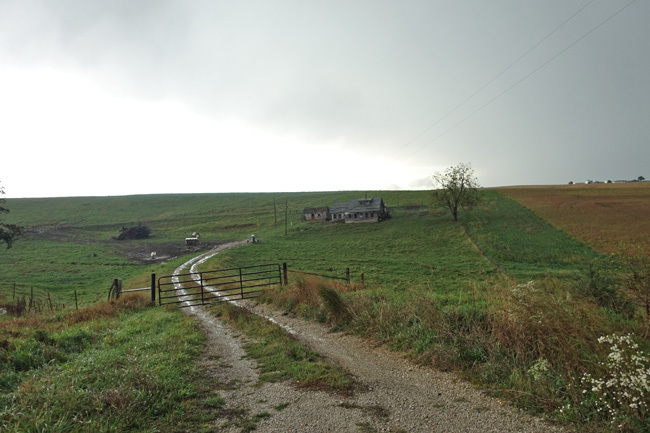 Farm fields stretched as far as the eye could see, punctuated by the occasional farmhouse. 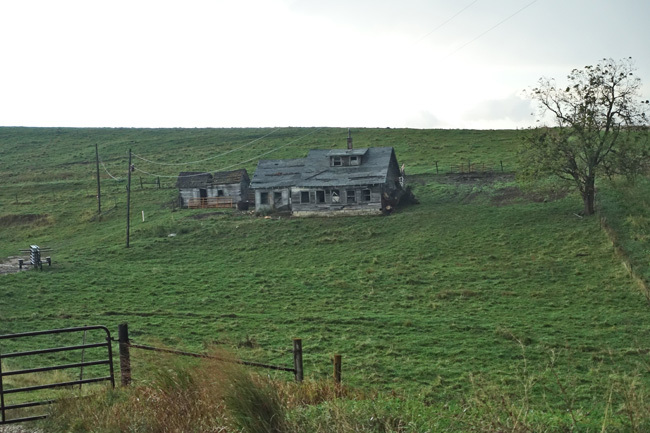 I pulled over to capture a few shots of a beautiful old abandoned homestead. I was tempted to get a closer look, but the ground was soft and wet and the rain was coming down steadily enough that another minute outside would have soaked me to the bone. 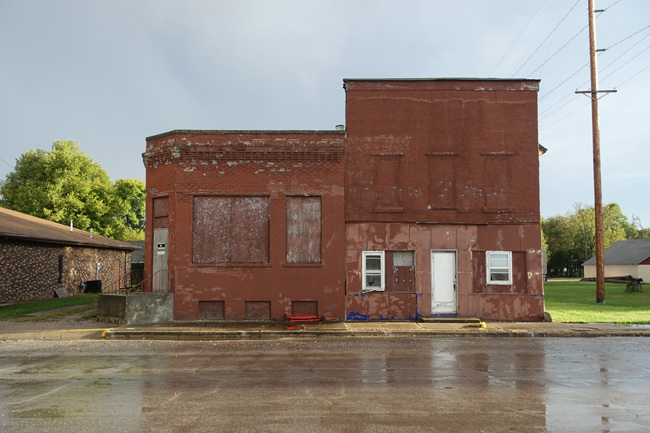 The rain had begun to subside by the time I reached the town of Grand Junction, Iowa. 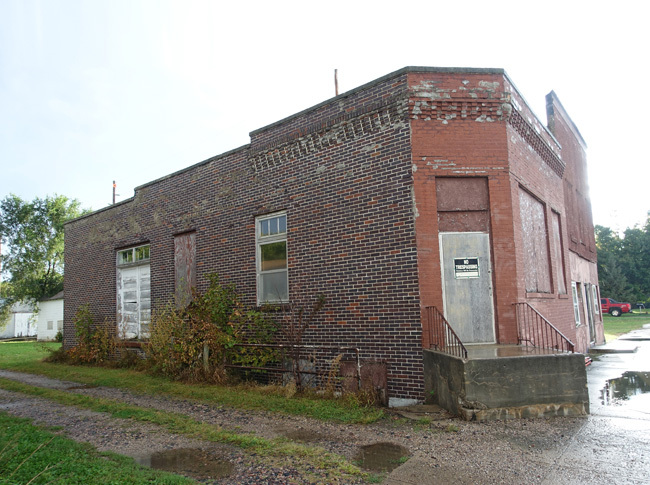 As I drove down the quiet main street, I was surprised by the number of boarded up buildings. Founded in 1873, Grand Junction was named for its location at the intersection of the Keokuk and Des Moines and the Chicago and Northwestern railroads. 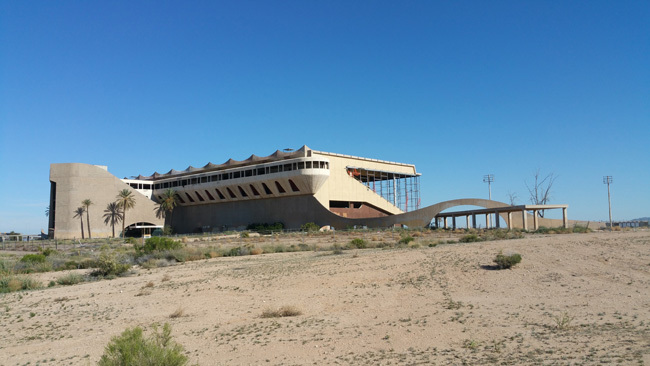 The once thriving community was devastated by the opening of Highway 30 in 1958, which replaced the Lincoln Highway and Bypassed Grand Junction, depriving it of the traffic that had kept its businesses alive. 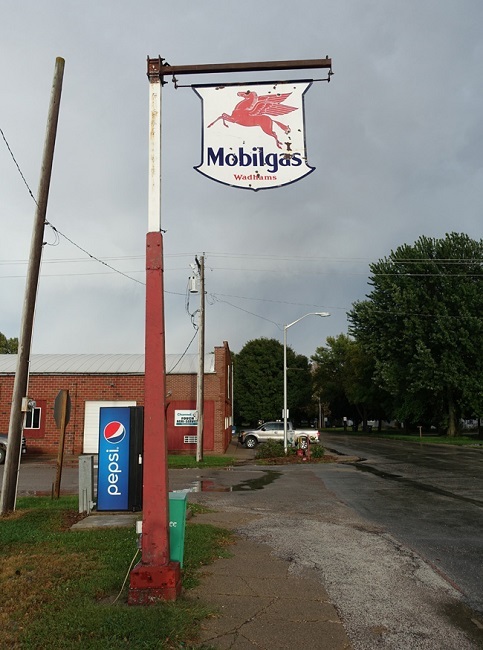 A well-preserved Mobilgas station stands as a monument to the past. The population of Grand Junction was 824 as of the 2010 census, but and has fallen below 800 in recent years. There is hope of economic recovery. 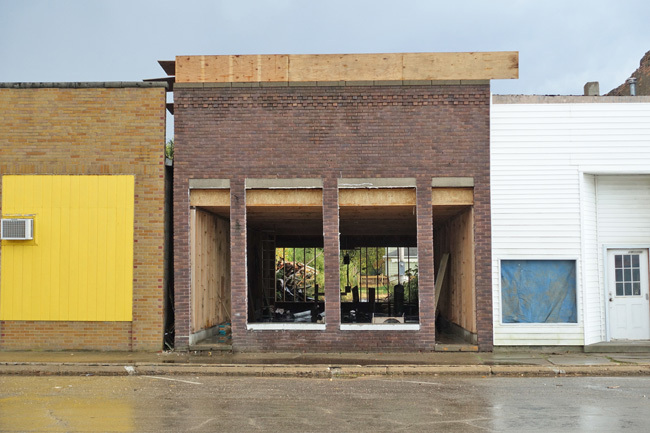 Despite the rain, a carpenter was hard at work renovating one of the brick buildings on Main Street. Revitalization efforts have taken place since the time of my visit, including the opening of a new state of the art city hall and community center. By the time I reached Fort Dodge, the storm had passed. 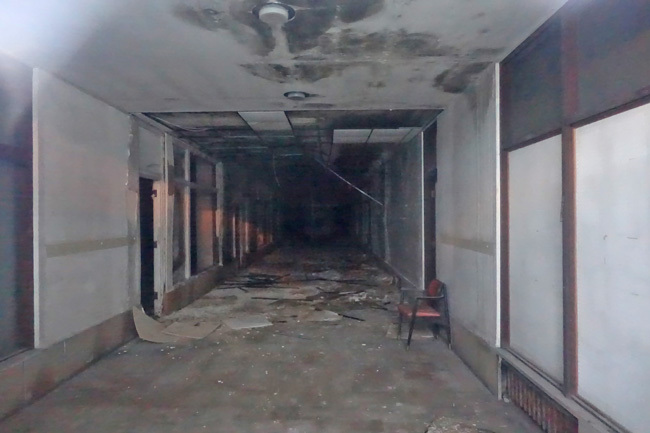 In the remaining daylight, I explored the downtown area, which is home to the massive abandoned Warden Plaza Hotel. 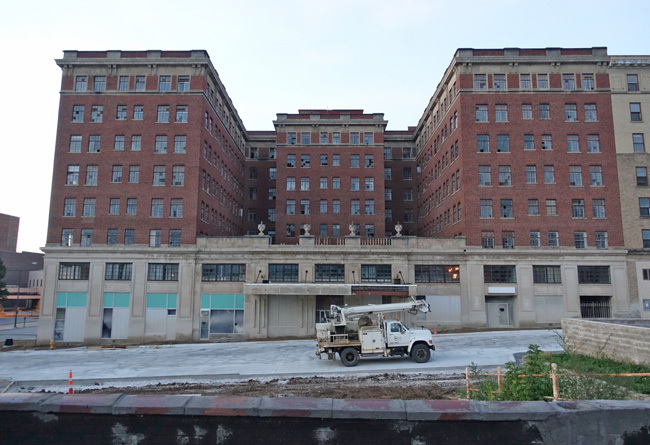 Financed by Theodore Warden, an Ohio coal mining investor and designed by O. E. Damon, the Warden Plaza Hotel was built in 1925. 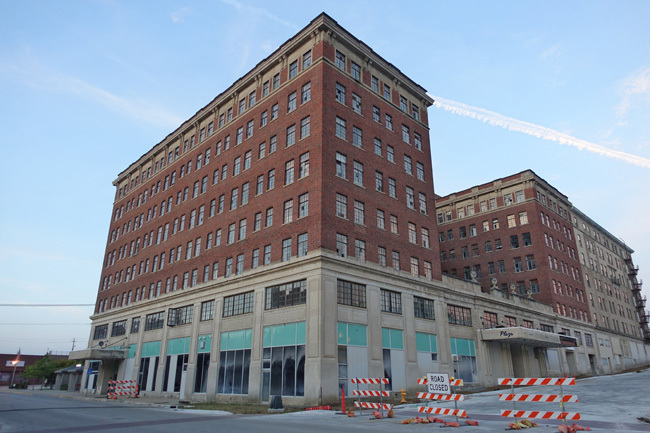 The first and second floor contained small shops and businesses, while the upper floors contained ballrooms, suites, and luxury apartments. 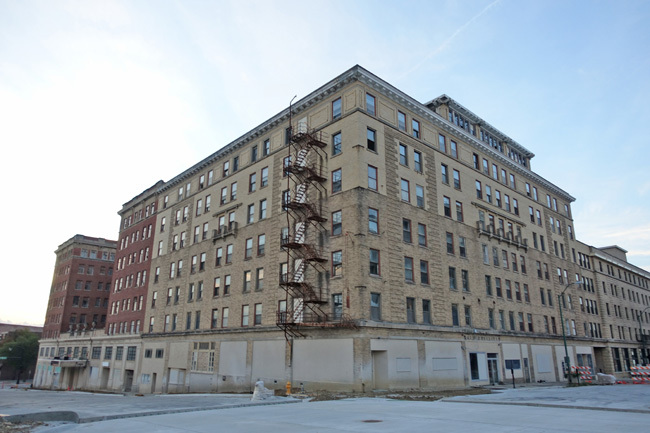 In the late 1970s, the building was transformed into apartments for elderly and low-income individuals. 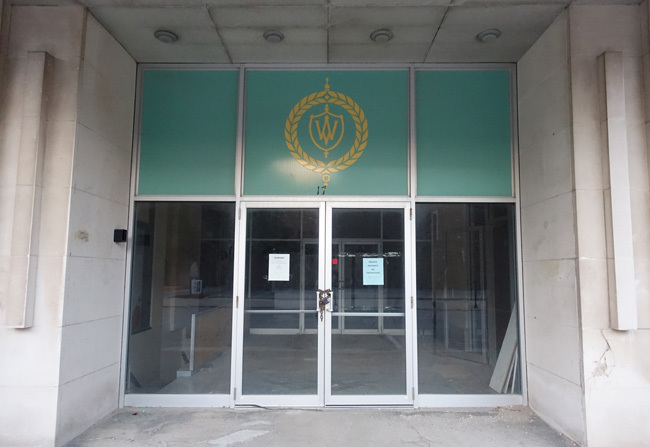 It closed in 2005 and has stood vacant for about a decade. 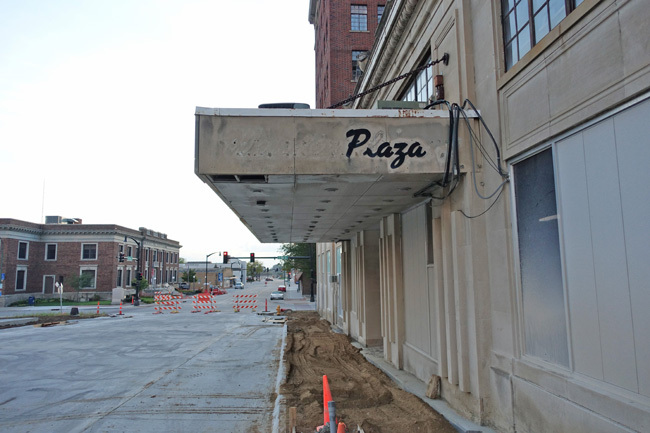 The Fort Dodge city government assumed ownership of the property in June 2016 and is attempting to find a developer to give new purpose to the site. 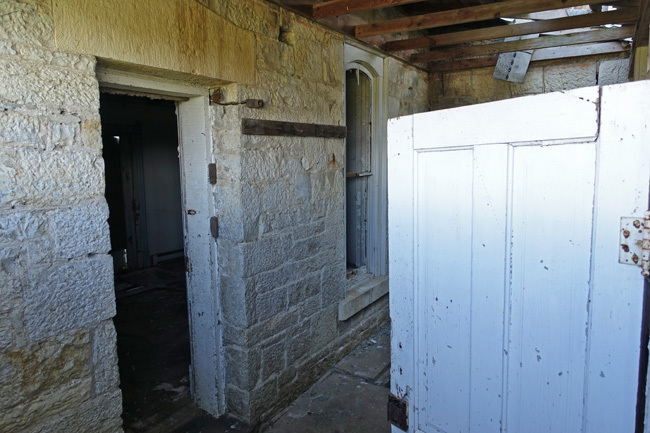 The structure is sealed up and inaccessible, but I was able to capture a photo of a decaying hallway through one of the windows. After the sun went down, I stopped at a great little restaurant called SmokeWorx, where I enjoyed a delicious BBQ pulled pork sandwich. With all my energy spent after a day on the road, I decided to call it a night. The next day had quite a bit of excitement in store, and I'd need plenty of rest. Be sure to come back next week for my exploration of a breathtaking abandoned brick factory. Great article as always. I envy you getting to travel and explore as you do. Keep up the good work. I used to travel and explore lot myself but circumstances don't allow me to do that any longer. So thanks for sharing all that you share. Thank you so much, Roger! It's my pleasure. I don't get to travel too often now that I have a full-time job again, but going through my pictures and journals from the road trips helps keep me sane until the next trip. Ah, Jim, this is great timing. 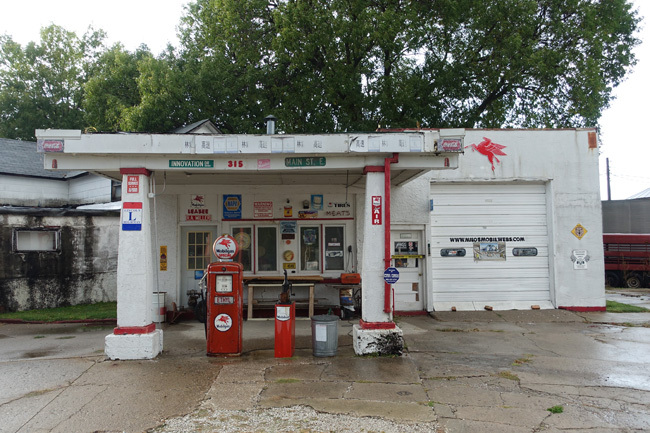 Hubby and I are planning our big adventure for this fall and if you go to Google maps and follow some of the OLD highways in Iowa(92, 22, 3 and 9), you'll find amazing towns that have all but been forgotten. I think this is going to top our Nebraska trips--it's as if they are trying to completely empty out the midwest....probably for some dastardly deeds like mega farms and oil pipelines and other evil stuff. Thanks, Sue. I look forward to hearing about your trip. Be sure to take pictures of any interesting abandoned places you see! It's tragic that big agricultural conglomerates and oil pipelines are replacing the beautiful old places. I should plan another trip into Iowa. It's fun to look at Google satellite view when researching places to explore. I've found some great locations that way. Thank you so much for the comment! It must be so interesting to salvage elements from the buildings and deconstruct them. I will definitely look you up the next time I'm in Grand Junction. I would love a tour of your beautiful buildings. Thank you! !